Once upon a time I, like many of you, felt that Facebook was just another way to waste a little, play a few games, and shamelessly self promote. Until one day a relative from a side of my family that I know very little about reached out and begin to share information. She shared stories, images, and insight into a world I never knew and intentionally tried to avoid. This is a relative from my father's side, a man always running from life and now died at 50. She's helped me realize that there is more to that par of my past, and me considering attending a family reunion this summer. That is a condensed version of my own Facebook fairytale, and I am sure some of have your own. Emily Liebert has complied some of her favorite fairytales and packaged them nicely in a brand new and inspirational collection. 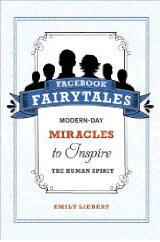 Inside Facebook Fairytales you will find twenty-five inspirational tales from reunited families to suddenly succeeding comedians to unlikely connection with royalty to finding an organ donor in the most unlikely place. This is light reading for those looking for a bit of that feel-good real-life tale. Facebook Fairytales will be released on April 1st by Skyhorse Publishing, but I am sure that Chicago has a few of its own "fairytales" to tell. What has been your remarkable and inspiring Facebook encounter?